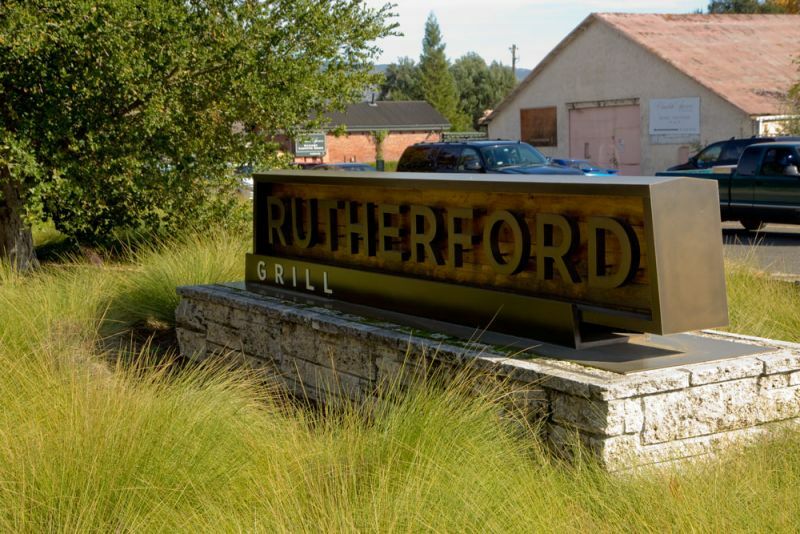 Rutherford Grill is one of Napa Valley’s most iconic restaurants. It is located on Highway 29 in the village of Rutherford, close to several of our favourite wineries. The menu is focused on grilled dishes; with an emphasis on well executed simplicity. We have eaten there several times, for both dinner and lunch, but have not done so since we started blogging. The Artist and I had a recent visit to Frog’s Leap and Miner Family Winery, both of which are close to The Rutherford Grill, so it seemed to be an excellent opportunity to eat lunch and write about the experience. The combination of location and reputation means that making a reservation is highly recommended. We were sat close to the door and heard someone being told that the wait for a table was an hour; even with unseasonably warm weather for November allowing the outside seating to be fully utilized. The Artist had raved about the ribs, but since we there for lunch, neither of us felt like ordering such a substantial dish. I also received a text from an app on my phone called Marsbot, which recommended the French dip sandwich, but I thought that the bangers would be a more unusual option; I have no regrets on the decision. For those not familiar with British culinary slang, bangers are sausages. The dish’s name is an odd juxtaposition of British and French. Bangers in the UK would usually be served with mashed potato or baked beans. I asked for it without coleslaw, which was a sensible choice for my taste, but does leave the picture of the dish looking a little bereft of colour. The waitress offered me an additional side or more fries. I appreciated this offer, although I declined. What was not clear from the menu was that the two sausages were quite different. The first one was very dense meat, with a complex blend of spices. The second had lighter meat and small pieces of apple. My clear favourite was the second one. The fries were crisp and lightly, but effectively salted. 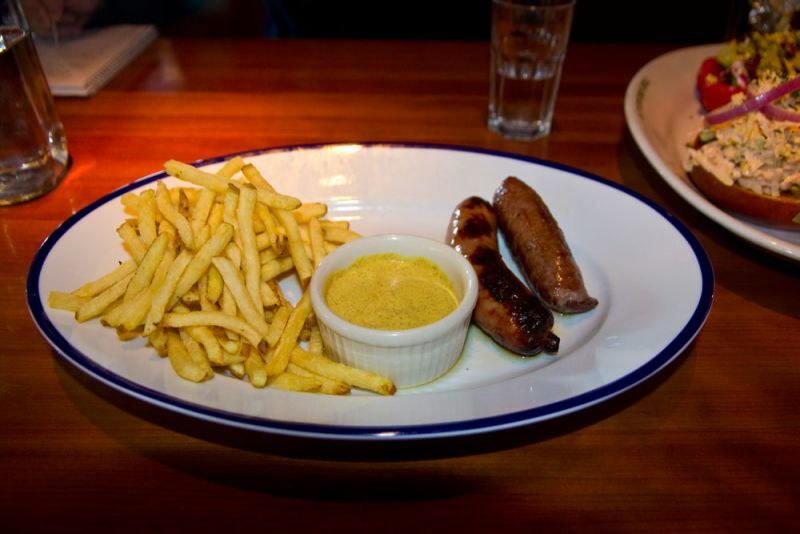 The mustard had a sharp flavour that was a great complement to the sausages; especially the first one. The Artist comments: I had planned to start with the fire-grilled artichoke appetizer until the Brit said he does not in fact like artichokes. It would have been too much food to eat on my own, so I was a little disappointed. I had to mention this dish in this post as I always order it during my visits. 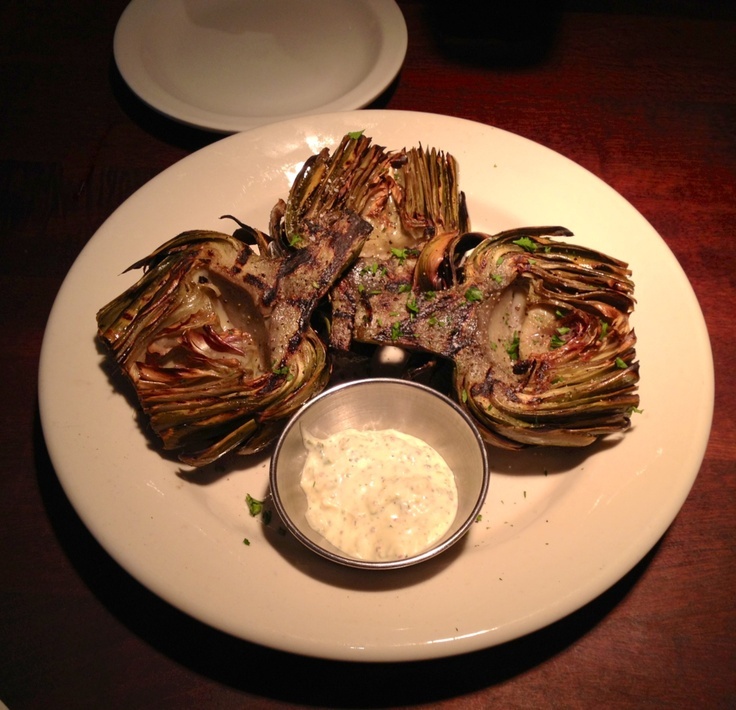 It is a fire roasted half artichoke which has been slightly charred and served with a garlic aioli. Superb! A staple appetizer for this establishment, and I would highly recommend it. The Artist comments: For lunch I ordered the fish sandwich. I do love a good fish sandwich, so felt I needed to give it a try. I am glad I did. The presentation was very attractive; starting with a freshly made bun that was crispy on the outside, but soft and fluffy on the inside. The fish was fried to perfection and topped with coleslaw, red onion, and sweet pickles. After biting into the sandwich, I realized that the fish was not your normal species of fish found in a sandwich. It was white, flaky, and dense; not cod, Alaskan pollock. or mahi-mahi, but I couldn’t place it. I asked the server; come to find out it was grouper. Huh, there is a first time for everything. I will have it again. Overall, we had a good lunch, with attentive service, at a reasonable price. 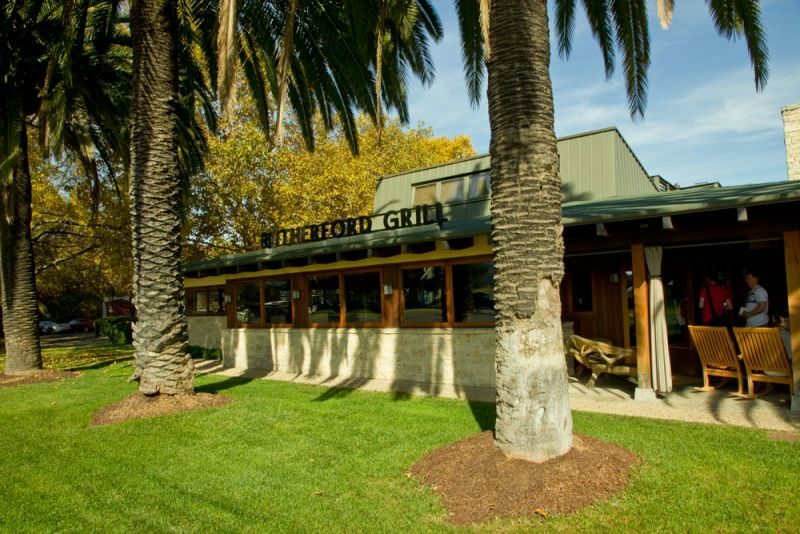 We put it on our highly recommended list of places to eat in Napa. P.S. 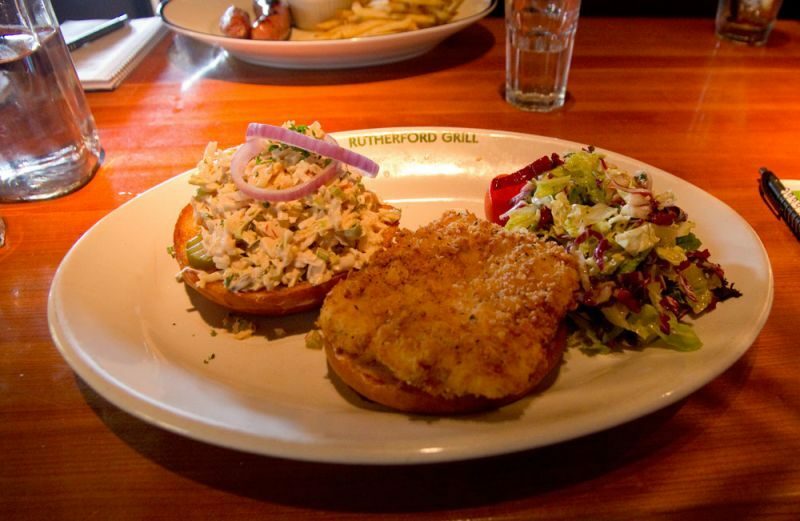 After writing this post, but before it was published, I went back to Rutherford Grill. On this visit, I listened to the previously mentioned phone app and tried the French dip sandwich. I can see why it was recommended; thin, juicy, and very tasty, slices of meat. The bread was excellent, with the meat juices soaked in it and an au jus which was not overly salted; a common problem. After we wrote this, we went back and had their artichoke starter with friends. It is as good as advertised. Thank you for reading and commenting John. Have a great day!